Communication styles and the differences between them cause a lot of undue stress. Here’s how to navigate the 4 primary communication styles at work. The differences between communication styles often cause more agony than they really need to. You know that moment when it’s 3:05 p.m., and you’ve just walked away from yet another frustrating conversation with a colleague? You can’t decide whether to bang your head against the desk, stress-eat your way through the office snack table, or simply pack up and call it a day. What you’ve probably just experienced is a clash of communication styles. While we benefit from working with people with diverse skills and personality types, that doesn’t mean everything is easy. Sometimes it feels like navigating the interpersonal dynamics is the tax we pay on having the right people in the room. But there’s another way of thinking about it. Understanding our differences – especially differences in the way we communicate – is actually an investment. The payoff? Stronger workplace relationships, which (attention, management types!) Keith Ferrazzi, author of “Who’s Got Your Back” points out is a major predictor of employee engagement, and therefore of productivity. Not to mention that more effective communication with our co-workers goes a long way in reducing stress. And who doesn’t want that? By understanding different communication styles and paying attention which styles our teammates gravitate toward, we can improve our interpersonal skills, build trust, and get more done with less frustration. There are a few different frameworks for understanding communication styles. Do a quick Google search and you’ll find the classic four: assertive, aggressive, passive-aggressive, and passive. These aren’t very helpful, though, since they’re all about a person’s outbound communication, and say nothing about what works best for them when it comes to inbound communications. Besides: mirroring someone’s passive-aggressive style isn’t likely to result in constructive workplace interactions. When figuring out how you can communicate effectively with someone, it’s important to understand their broader personal style. Are they direct? Analytical? Sociable? Business-like? Behavioral traits clue us into how people respond to information, which, in turn, helps us anticipate how to communicate in a way that builds rapport and strengthens the relationship. The DiSC profile provides a useful framework for our purposes here. 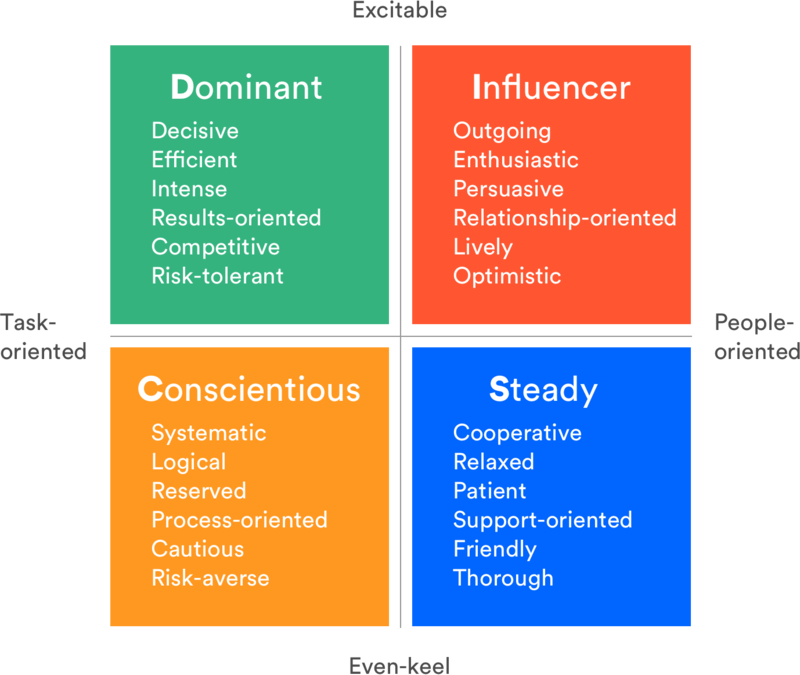 Through a self-assessment tool, DiSC categorizes your primary style as Dominant, Influencer, Steady, or Conscientious. It’s important to understand that most people have shades of the other types, but for our purposes here, we’ll be focusing on their primary style. People who have a “dominant” personal style (known in similar frameworks as “director” or “driver”) are in love with action and focused on results. They prefer to think about the big picture, and leave implementation details to others – there’s a pretty good chance your boss is primarily dominant. Patience and sensitivity are within a “dominant” communicator’s grasp but require some effort. Get right down to business, and stay on-topic. Be prepared to field follow-up questions on the spot so you can answer with confidence. Expect them to be decisive and fairly blunt. Taking their bluntness, follow-up questions, and/or impatience personally – seriously: it’s not you, it’s just how they are. Making promises you can’t deliver on. Expecting them to open up about their weekend plans, or engage in casual chit-chat. Dominant types are often very accomplished, excitable, and love a good challenge. They’re the ones you want to recruit for that moon-shot project you’ve been noodling on, especially when you’re determining goals and KPIs. People with the “influencer” personal style (known in similar frameworks as “initiator” or “socializer”) are your classic “people” people. They are friendly, upbeat, and always on the pulse of the latest trends. They thrive on interpersonal relationships, which makes them ace collaborators. A word of caution, though: long-term focus and follow-through aren’t their strong suits, so best to engage them in shorter collaborative bursts. Approach them in a casual manner, and let your sense of humor show. Put details and facts in writing for them to refer back to after a verbal conversation. Expect them to be a little too optimistic about ideas, as well as their own abilities and the abilities of those around them. Talking down to them or be curt. Trying to confine the conversation or stifle their freedom to express ideas and emotions. Expecting them to dive deep into the details with you. Influencers strive to be emotionally honest and are quick to trust those around them. If you’re trying to re-shape the culture on your team (I suggest this exercise for building team culture, btw), an influencer might be the perfect partner-in-crime. People who have a “steady” personal style (known in similar frameworks as “relator” or “harmonizer”) emphasize cooperation and are loathe to upset the apple cart. They value consistency, stability, and loyalty. You’ll often find them in service-flavored roles like customer support and IT help desk. They can adapt quickly when they have to but may need some extra encouragement along the way. Practice active listening, and confirm that you’ve heard them by summarizing what they’ve just said to you. Approach them with a relaxed vibe, and break the ice by acknowledging a recent contribution they’ve made. Expect them to ask for details. Rushing them into a decision. Assuming they support an idea 100% just because they don’t voice opposition. Expecting them to intuit priorities and deadlines – it’s helpful if you spell those out. Steadies are even-keel people who love to be in a cooperative environment where everyone understands their roles and responsibilities. If your team is in turmoil, a steady likely won’t lead the effort to restore normalcy, but they’ll be a strong ally. People of the “conscientious” personal style (known in similar frameworks as “analyzer” or “thinker”) are in the business of precision and place a high value on competency. They jump at the chance to demonstrate their expertise and build new skills – just the sort of person you’re likely to find in an engineering, data science, or analyst role. They aren’t unfriendly, per se, but probably won’t chat you up about weekend plans or volunteer to organize a team dinner. Provide as many details as possible up front, organized as systematically as you can. Give them clear expectations and space to work independently (they’re really good at it!). Expect them to double- and triple-check all the relevant info before making a decision. Framing feedback on their work as “criticism”. Responding to them emotionally – use words like “know” or “think” instead of “feel”. Expecting them to ease into a conversation with chit-chat. Conscientious types are not only cautious but highly systematic. They’re the person you want to partner with when assessing risks, or running a pre-mortem for the project you’re about to launch. Thinking back, many (if not most) of the stressful interactions I’ve had were caused in part by a mismatch in communication styles. By the same token, most effective interactions I’ve had with co-workers featured a level of comfortable formality, complementary body language, and a general feeling that we “get” each other. Communicating with teammates in a way that resonates with them is an express lane to building trust. It’s a way of saying “I see you for who you are, and I’ve got your back.” And guess what? They’ll have your back, too. Better communication comes with practice. Whether your team is struggling or thriving, you can hone your communication skills using the Team Health Monitor – a free self-assessment exercise for teams who want to improve the way they work together. Visit the Atlassian Team Playbook to find everything you need to get started: full instructions, downloadable materials, and a short intro video.